This is a simple instruction on how to initialize Ubuntu Droplet in DigitalOcean. We will use Ubuntu 16.04 32 bit in this case. We have to use a normal user instead of the root account. Normally the root account should be disabled. First, we have to add a user by executing the following command. Let’s assume the intended username is john. Then we need to add the above user account into sudo group by executing the following command. Select the public key, and copy it to your clipboard. To enable the use of SSH key to authenticate as the new remote user, you must add the public key to a special file in the user’s home directory. Now you will be in your new user’s home directory. Now insert your public key (which should be in your clipboard) by pasting it into the editor. Hit CTRL-X to exit the file, then Y to save the changes that you made, then ENTER to confirm the file name. Now that we have our new account, we can secure our server a little bit by modifying its SSH daemon configuration (the program that allows us to log in remotely) to disallow remote SSH access to the rootaccount. Here, we have the option to disable root login through SSH. This is generally a more secure setting since we can now access our server through our normal user account and escalate privileges when necessary. Disabling remote root login is highly recommended on every server! When you are finished making your changes, save and close the file using the method we went over earlier (CTRL-X, then Y, then ENTER). Now that we have made our change, we need to restart the SSH service so that it will use our new configuration. Now, before we log out of the server, we should test our new configuration. We do not want to disconnect until we can confirm that new connections can be established successfully. Open a new terminal window on your local machine. In the new window, we need to begin a new connection to our server. This time, instead of using the root account, we want to use the new account that we created. Note: If you are using PuTTY to connect to your servers, be sure to update the session’s port number to match your server’s current configuration. You will be prompted for the new user’s password that you configured. After that, you will be logged in as your new user. Static IP configuration can be found in file /etc/network/interfaces. This applies to Debian or any derivatives such as Ubuntu. Change the file content to be similar like below. Please ensure to look closely on iface eth0 section. You can change the IP address based on your preferred address. # This line ensures that the interface will be brought up during boot. # eth0 – This is the main IP address that will be used for most outbound connections. # The address, netmask and gateway are all necessary. It is better to disable root user login since allowing root user login is a major security concern in Linux system. You can use root login after logging in as another user. You should install all available security updates in order to protect against unauthorised access to your Linux/Ubuntu box. The commands can be found in the following. Please ensure to enter your root password since you are using sudo command that gains super access to your Linux system. 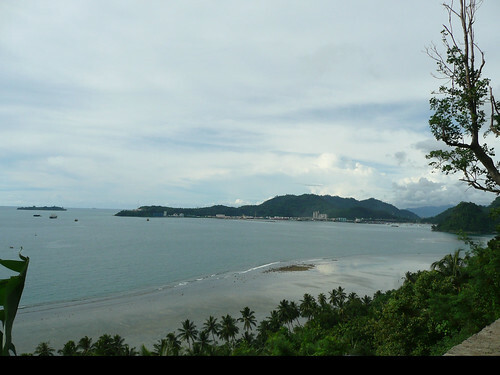 Padang is a beautiful city as a capital city of West Sumatra Province, located at the west coast of Sumatra facing directly to Indonesian Ocean (Hindia Ocean), the ocean view is magnificent especially during the sunset. Padang has a hot climate, the temperature a bit high about 32 degrees C during the day and a bit cool in the early morning because of a cool wind from the ocean. Padang is easy to reach, you could fly from Singapore for one hour only, or you could fly from Jakarta the National Capital of Indonesia for 1 hour and 45 minutes, the International Airport of Padang is Minangkabau International Airport or Bandara International Minangkabau (B.I.M). 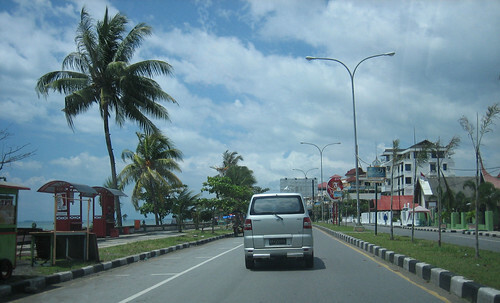 The distance from BIM to downtown approximately 25 kilometers, or you could go to Padang Panjang or Bukittinggi with the distance approximately 60 kilometres. We just visited Mount Titlis the extra ordinary beautiful mountain in Switzerland, we wanted to continue our journey to Frankfurt via the Romantic Road along to the Rhine River in Germany. 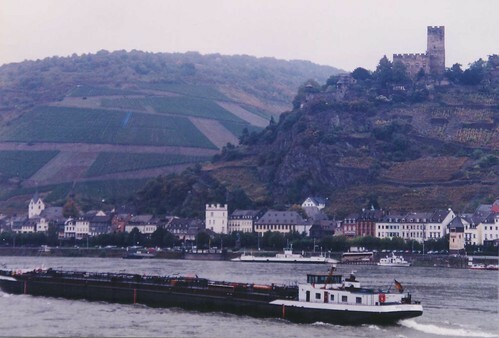 Rhine River become as a main water transportation mode to move cargo or oil from the hinterland to the upper end, so this transportation mode become most economical. 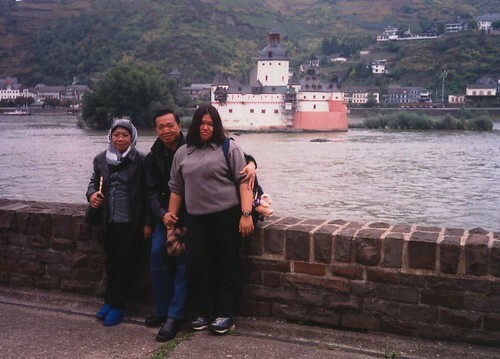 On our way we stopped at Loreley-also written as Lorelei, where I heard a Germany Folklore from the native of Loreley|Lorelei, that once upon the time there was a beautiful young maiden who jumped from the rock formation to the Rhine River and killed herself. The beautiful young maiden was in love with somebody but this is a faithless love, she has a broken hearth. The Loreley|Lorelei is a rock on the eastern bank of the Rhine River near St Goarshausen Germany, this Romantic Rhine Valley about 25 km from Rudesheim and 80 km from Frankfurt Airport Germany. In some area the river become narrowed and the ship captain should be careful not to hit the river bank or rock formation. According to that fairy tale, the peoples who passed the Romantic Rhine Valley, the Loreley|Lorelei could be heard a singing from from the Rock formation along the Rhine River. The Loreley|Lorelei a Romantic Rhine Valley is a good place to have a rest because it’s beautiful scenery and fresh air, some cafes are available for you and family for refreshment. Sie kämmt ihr goldenes Haar. That I can’t get out of my mind. He only looks up at the heights. Do you like to sail around Horseshoe Bay Vancouver British Columbia? Horseshoe Bay is a well known for its Beautiful British Columbia Ferry Terminal serving Sunny Cove at Bowen Island, Longdale on the Sunshine Coast and Departure Bay in Nanaimo on Vancouver Island, British Columbia, Canada. Horseshoe Bay was a traditionally meeting point, used both as seasonal fishing and place to spent a night when traveling between villages on the Squamish river and Burrard Inlet. The pleasant waterfront of Horseshoe Bay a place of variety restaurants, cafes, shops, boutiques. Recreation in and around Horseshoe Bay including sea kayaking, scuba diving, boating, hiking, skiing. Rent a boat in Islamorada, sea safaris are available at Sewell’s Marina in Horseshoe Bay, the family operated marina has operated since 1930’s. 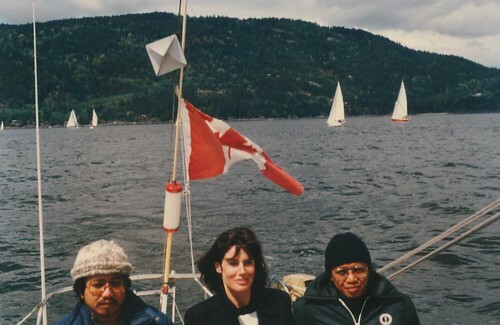 I like sailing around the Horseshoe Bay, watching the spectacular Beautiful British Columbia. Photo:Myself wearing black hat with my Canadian friend on the rear boat around Horseshoe Bay. At Horseshoe Bay the highway ends and ferry travel begin to those heading for Bowen Island, Sunshine Coast and Nanaimo. To reach Horseshoe Bay from point south, visitors must enter City of Vancouver first, make their way across Lion Gate Bridge to West Vancouver, then follow the sign for the Ferry Terminal. Visitors from the east need only to stay on Highway No.1, then Trans Canada Highway. Vancouver Beautiful British Columbia is tourists delight with ocean and mountains a lot of to sea, you could experiencing walk on the top of the tall trees and sways on Capilano Suspension Bridge, watch Capilano Salmon hatchery. In City of Vancouver you may walk along the bustling Robson Street see the night life and window shopping, or dining at the revolving restaurant while watching the light sparkling from the islands surround. A lot of Americans come to Vancouver, British Columbia, Canada during weekend or holiday because Vancouver is so close with Seattle of Washington State of The United States of America-USA., just drive cross the border of America to Canada. I missed Vancouver Beautiful British Columbia, I missed my friends long time no see. When I visited Washington, D.C. some years ago, I have a chanced visited President John Fitzgerald “Jack” Kennedy’s gravesite or popular with JFK at Arlington National Cemetery, where his brother Robert Kennedy former Attorney General of USA and JFK’s wife Jacqueline Bouvier Kennedy Onassis was buried also adjacent to John F Kennedy’s gravesite. 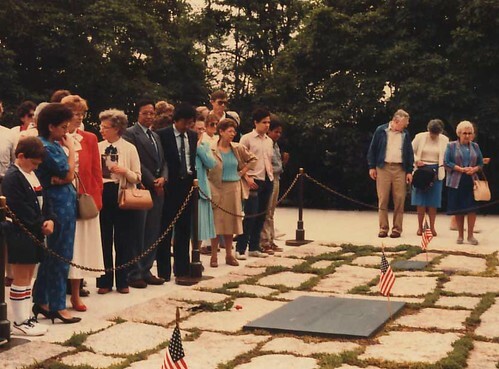 John F Kennedy’s gravesite is famous with it’s The Eternal Flame, I think the only one gravesite with The Eternal Flame in Arlington National Cemetery. John F Kennedy was born on 29th May 1917 at Brookline Massachusetts, a second son of Joseph P Kennedy senior and was the 35th President of The United States of America, serving from 1961 until his assassination on 22nd November 1963. John F Kennedy-JFK was assassinated in Dallas, Texas, on his state visit with his wife Jacqueline. Lee Harvey Oswald was charged with crime and was murdered two days later by Jack Ruby before he could be put on trial, you could read conspiracy theory. John F Kennedy was my idol since I was a little boy, I read the story about his heroism and patriotic action during the world war 2, that way I always remember him and I was cried when I heard that Kennedy was murdered. I never forget when his little son John John gave a military salute to the President cascades on his funeral procession. On August 2nd, 1943 Kennedy’s boat the PT 109 was rammed by Japanese destroyer in Pacific Ocean, Kennedy swam towing a wounded man to an island and later to the second island, for his patriotic and heroism Kennedy received The United States of America’s Navy and Marine Corp Medal. This time we are going to visit Musee du Louvre the famous Museum in Paris, Musee du Louvre located at Palais Royal Musee du Louvre, 75001 Paris, France. Musee du Louvre lies between the Seine River and the Rue Rivoli on the Right Bank neighboring 1er arrondisement is home of the destroyed Palais des Tuileries and the Tuiliries Garden. Musee du Louvre has a huge of floor space, part of the museum located at underground. You could enter Musee du Louvre from a building glass of pyramid, you may pass the Carrousel and Tuileries garden. The Jardins du Carrousel and the Jardins du Tuileries the major stage in the history of French sculpture. Musee du Louvre offers a range of cultural and educational activities, so everybody must visit Musee du Louvre when they visit Paris the City of Light. -Museum three great ladies-The Venus de Milo, the victory of Samothrace and Monalisa the famous painting around the world. -Caligraphy in Islamic Art, the Louvre’s collection of Islamic Art highlight the importance of writing in Islam world. -The Art of Eating at Table. From Musee du Louvre we continue our journey to the Church Notre Dame du Paris, where in front of that Church located Zero Point of Paris, as a bench mark of City of Paris, France. You must not forget to have a something to drink and eat at Billboard Coffee in Paris refined garstronomica tradition nearby the Notre Dame du Paris. Please have a look at the video to show our journey in Paris. Have you ever eat Soto Kudus? 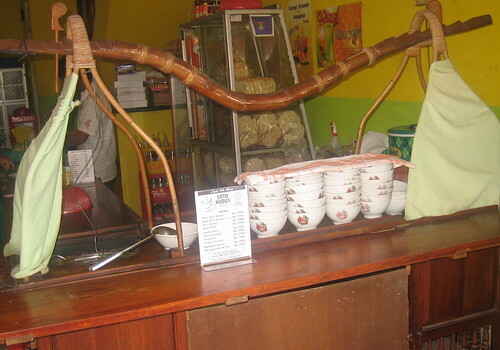 The City of Kudus is a capital of Kudus Regency, where Soto of Kudus originated. 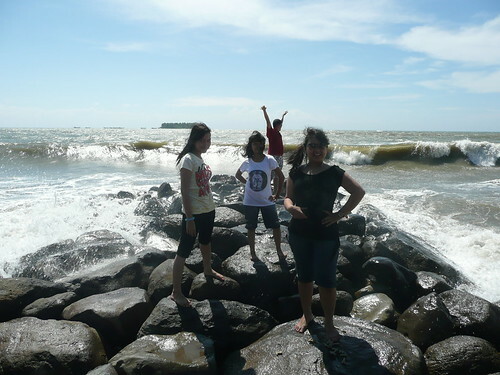 The city of Kudus located in Central Java Province, in the State of Indonesia. You could find Soto Kudus anywhere in Indonesia with it special Soto Kudus cart as shown on the photo above, Soto Kudus contents are meat, potato, sprout, white noddles, eggs, yummy..yummy. The City of Kudus is famous early center of Islam spreading in Indonesia, you could find a mosque with a special minaret in Kudus as build by early Islamic spreaders. The Regency of Kudus has an area about 425 sq meters, bordered with Pati at east 25 km, Demak at west 25 km, Jepara at north 19 km and Grobogan at south. The main production from Kudus are sugar cane and cacao, in Kudus located a big cigarette factory and badminton sport training center sponsored by PT.Djarum Kudus. How to go to Kudus? 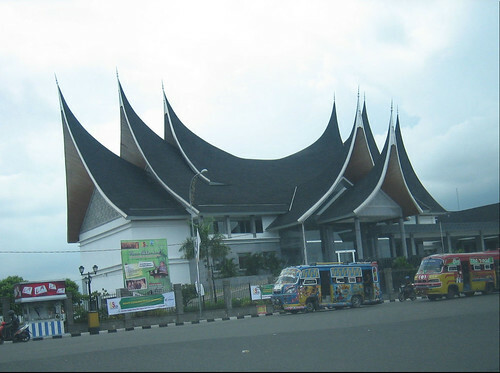 The nearest city is Semarang the capital of West Java Province, the airport of Semarang is General Ahmad Yani Airport. The distance from Semarang to Kudus is about 51 km, while the other City is Solo or Surakarta about 98 km. If you come from Jogyakarta the center of Kingdom of Java, you could go to Solo with a distance about 60 km. Accommodation is available in Kudus, or you may choose the hotel accommodation in Semarang because the distance is not too far. Photo:One portion of Soto Kudus and steam rice in Jakarta it cost US$1.00 only.